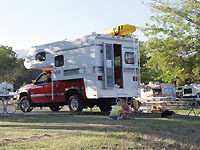 A slide-in camper is made to be toted by a pickup, and there’s a wide range of equipment levels available. The economy models can be very low-priced because you’re not buying a motorized chassis or even a trailer-type chassis. Some campers are little more than four walls to keep the weather off your head, a bed, a wardrobe and some cabinets. At the other end of the spectrum, high-end units contain most of the comfort features and amenities found on any well-equipped RV on the road today. Many campers now also include one or more slideout rooms to further expand the interior space. Campers are available in fixed hardwall and fold-down hardwall or partial soft-wall versions. The hardwall models offer better insulation, security and some interior feature benefits, but they’re typically heavier and have a fairly high center of gravity. A fold-down camper offers less wind resistance while traveling, is typically lighter and has a low center of gravity for improved handling on the road. A fabric-wall model also has less insulation capability due to the fabric-wall segments. The full-hardwall clamshell-type fold-downs are less common, but an interesting blend of the good points of each camper type. A camper is easy to haul and maneuver, and it leaves the pickup free to haul a boat, horse trailer or other recreational toys, gvwr permitting. Plus, the camper can be dropped at the campsite to free the pickup for local driving. Its main drawback is size, as it’s generally restricted to the bed dimensions of the pickup. Weight is also a point that’s very important. The pickup must be rated to handle the weight of the camper and its contents to avoid an overloaded situation, and it’s especially critical in today’s larger, well-equipped models.